Having two children very close in age is NOT the same as having twins. I’m not saying that a small age gap between siblings isn’t tough, it just isn’t the same as having multiples. Having two babies at the same time is a rather unique situation and I’m not just talking about the birth. There’s the night feeds – three/four times a night times two, because of course they don’t wake for feeds at the same time (it took me ages to figure out that I should wake the other baby when one woke for a feed!). There’s double the winding. There are double the explosive newborn poos. There’s that distinctive newborn cry times two (usually at the same time). Oh yes, there’s also the vaccinations where you have to ignore the first screaming child so that the doctor can hurriedly move onto the next one. Then there’s the weaning times two. Do you try completely feeding one child first and then move onto the second (risking meltdown of said child) or do you alternate; one spoon for one then one for the other? Or do you do baby-led weaning and pick up bits off the floor continuously and lose track of which child has actually eaten anything? Potty training times two. Train them together or stagger? One way you hopefully get it over and done with quicker but accidents can seem constant. However, staggering means the process could go on for a year! Same toys or different toys? Either way they’ll certainly end up fighting over ONE toy even if the other twin has an identical one! Megan Woolsey and Alison Lee, both parents of multiple and authors of Multiples Illuminated, know all about the above! Their books are a collection of stories and advice about life with twins or more. The first book covers newborns to age two. I read it when we were passed that stage and it was an entertaining reminisce. I found myself both smiling and clenching teeth about life with newborn multiple babies and young toddlers. 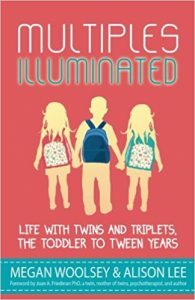 When I was asked to review their second book: Multiples Illuminated: Life with Twins and Triplets, the Toddler to Tween Years I was eager to start reading about what I might expect during the next stage/s. I felt a mixture of excitement and apprehension! One contributor says on passing the newborn and toddler stage: “It never gets easier. Every phase is difficult, but the difficulty in raising multiples just evolves as the years progress.” There’s no sugar coating, but at the same time there’s so much positivity in the book. I was really interested in the anecdotes about ‘separation anxiety’ and whether to split twins up at school. 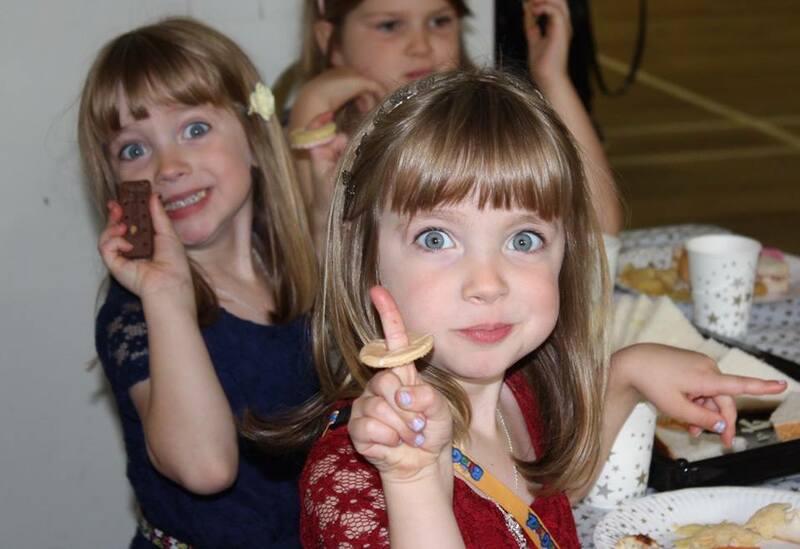 I put my twins in different classes for a number of reasons and feel like my choice has really benefitted my daughters (it hasn’t benefitted me when it comes to birthday parties, them being in different school productions and there being twice as many class meetings!). The book really highlights that there is no “one-size fits all” and there is no right or wrong on this or any number of other issues relating to raising multiples. There is discussion about the first birthday party/play date where one is invited and the other isn’t. This was something that started off as a very major thing for us, but we progressed. My twins are now a lot more accepting when this happens, as it does, frequently. There are stories of the interpersonal relationships: competing, fighting and talking over each other but also the love, protectiveness and solidarity. Along with poems, funny tales of poo incidents and teatime squabbling, there are some really poignant and serious topics covered. I particularly liked the six tips to help encourage individuality for tween multiples and the helpful tips for surviving and thriving during the toddler to teen years. I also read with a lot of interest the stories about the often complicated relationship between multiples and other siblings.